The classic French dish turned into a hearty soup that's faster and easier than the traditional braised recipe. In Dutch oven or large heavy pot, cook bacon over medium heat, stirring occasionally, until crisp, about 4 minutes. Using slotted spoon, remove to paper towel–lined plate. Set aside. In same Dutch oven, heat oil over medium-high heat; sauté chicken until golden, about 3 minutes. Using slotted spoon, remove to plate. Set aside. In same Dutch oven, cook potatoes, mushrooms, leek and garlic over medium heat, stirring, until mushrooms and leek soften, about 3 minutes. Stir in tomato paste; cook for 1 minute. Stir in broth, wine, mustard, salt, pepper and 1 cup water; bring to boil. 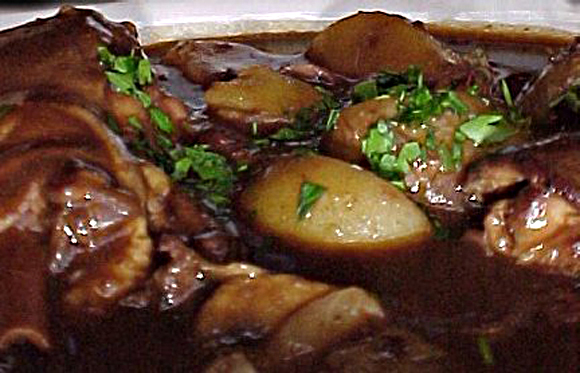 Reduce heat, cover and simmer gently just until potatoes are tender, about 10 minutes. Stir in bacon and chicken; cook, fresh thyme, uncovered, until chicken is no longer pink inside, about 3 minutes. Stir in parsley.